Ever since the the "pyramids" affair began, Mr. Osmanagic, his team and his supporters, have never stopped repeating the mantra that, as far as orthodox archaeologists were concerned, the Visoko region would be "terra incognita". This enables supporters of the Foundation to claim 1) that "official" archaeologists are not doing their job; 2) and that, thanks to Mr. Osmanagic, the archaeological riches that the region has to offer will be revealed to the world. This idea is false on two fronts; first, even if it’s perfectly true that there is still plenty of investigation left to do, the archaeology of the Visoko region is in fact much better known than Mr. Osmanagic either says or hopes; second, it is fast becoming ever more evident that the "excavations" conducted by him and his team, far from making freely available the region’s undeniable archaeological bounty, have already caused at least partial damage to more than one archaeological site. 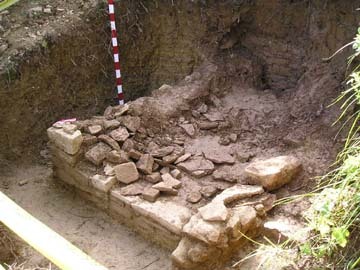 As far as the mediaeval era is concerned, there is undoubtedly a profusion of archaeology to be found in the Visoko region . Visoko and the immediately surrounding area, along the Bosna valley, at one time formed the very heart of the mediaeval kingdom of Bosnia. I have already mentioned Visoki, the fortress and royal residence where, during the 14th century, numerous royal charters were drawn up. The site of the fortress, quite well known, has been plotted out, some excavation has taken place, and, back in 2004, the site was designated as a National Monument (en). But the slopes of the hill of Visocica, probably an area of dense settlement during the mediaeval era, are still awaiting proper excavation; fortunately, the decision taken in 2006 by the Commission for the Protection of National Monuments to extend the protected area has effectively prevented any further "excavation" on these slopes, slopes where Mr. Osmanagic, in his eagerness to expose the geological substrate that he calls the "walls" of the "pyramid of the Sun", was effectively clearing out the topmost layers of what could well have been archaeological strata. Thanks to the invaluable work of the archaeologist and mediaeval historian, Pavao Andelic, it has been shown that numerous other sites beside Visoki attest to the crucial role of this valley in the mediaeval kingdom. The site of Mile/Arnautovici (en) , for example, is an important political and religious centre, and was excavated at the beginning of the 20th century by the Austrian archaeologist Carl Patsch before being studied exhaustively during the 1970’s by Pavao Andelic, who rescued it from oblivion and ensured that it received recognition as a site of national importance . At Mile - also used for assemblies of the Bosnian States - are to be found the remains of the church of Saint Nicholas (in fact, four superposed constructions: one dating from late Antiquity; a Romanesque church; and two successive Gothic churches), where the coronation of various Bosnian kings took place – in particular, Tvrko I Kotromanic and Stjepan Tomas. Also to be found there are the remains of a Franciscan monastery, and, inside and outside the church, over a hundred tombs, including several royal ones (Stjepan II Kotromanic and Tvrko I Kotromanic). Another important site, never excavated, is that of Mostre, which, according to some, was a religious and university hub, and a seat of the dignitaries of the schismatic Bosnian Church (ecclesia bosniensis, considered heretical by both the Roman Catholic Church and the Orthodox Church). We may also mention the site of Biskupici, also in the Bosna valley, location of the discovery of one of the most important documents of Bosnian mediaeval epigraphy, the "Tablet of Kulin Ban," dating from the end of the 12th century. However, human settlement in the valley of Visoko long pre-dates the Middle Ages, for numerous prehistoric sites are also known. Stultitia, who has made a detailed study of the bibliographies of the history of the region - something that the Foundation’s "experts" never seem to have quite got around to – publishes on her blog some very interesting extracts from a monograph written in 1984, "Visoko and its surroundings through history". The first part of this book was the work of several historians and archaeologists (Ivo Bojanovski, Borivoj Covic, Brunislav Marijanovic) under the direction of Pavao Andelic, and is a summary of the knowledge and archaeological sites in the Visoko region during Prehistory, Antiquity and the Middle Ages. There is a wealth of information on the two best researched sites - Arnautovici and of Okoliste (numbers 5 and 6 on the map) - the only ones that had been at least partly excavated at the time of the books publication. Okoliste, a Butmir culture site (so named from the site of Butmir, near Sarajevo), is dated c. 5200 BC to 4500 BC, and is probably of most interes. Five years ago now, new excavations began, carried out by an international team led by Zilka Kujundzic-Vejzagic  from the Sarajevo Museum, and by Johannes Müller from Kiel University in Germany (see the pages devoted to Okoliste on the websites of Kiel University (de) and Deutsches Archäologisches Institut (de) ; see also this summary in English, or this one on the website of the Sarajevo School of Science and Technology). These excavations - which, incidentally, have been entirely financed by the German Institute, the Bosnian authorities never having contributed a single penny - have revealed it as one of the most important places in Neolithic Europe - because of its size, perhaps even unique. For this was unquestionably a large settlement, consisting of some 300 houses surrounded by several enclosures and fences. It was probably home to about 3,000 inhabitants (an exceptionally large number for the Neolithic, when settlements did not generally consist of more than a few hundred people). 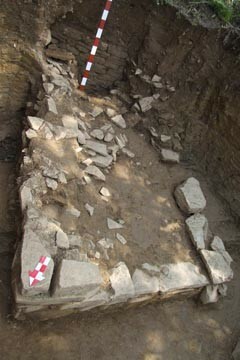 Beside a huge amount of material (lithic material, ceramics, statuettes...), the site could well provide archaeologists with answers to some crucial questions, particularly concerning the process of transition from "simple, egalitarian societies of small settlements to complex, hierarchical societies with big, dense settlements" . 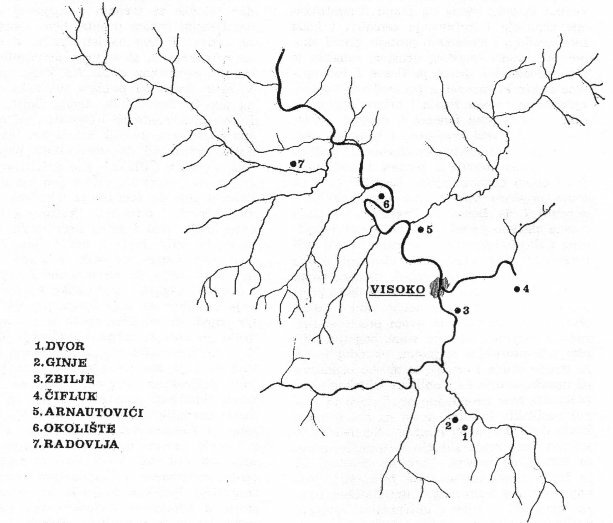 Among the other Neolithic sites mentioned in the monograph is Zbilje (number 3 on the above map), which is described as extending over a very large area of the high river terraces. It must be emphasized that Zbilje is, more specifically, a village situated at the foot of the hill of Pljesevica, the so-called "Pyramid of the Moon", and that a large part of Mr. Osmanagic’s “excavations” are taking place at the foot of that hill: the reader can see here the location of the various test pits, and the fact that test pits number 1 and 12 are located right on top of the "high terraces" at the foot of the hill. It’s possible that two other sites believed to date to the Neolithic, Dvor and Ginje (numbers 1 and 2 on the above map), south of Visoko, may also have acted as lures to amateur pseudo-archaeologists trying to follow in Mr. Osmanagic’s footsteaps. Indeed, on the Foundation website there is a series of four documents (1 (bs), 2, 3 (bs) and 4 (bs)) written by a group of enthusiasts, an "architect graduate", and two "veterinary science graduates", who exultantly present to Mr. Osmanagic their discovery of two "formations" near the villages of Dvor and Ginje. Absolutely convinced that they had found new traces of the "mysterious civilization" that built the pyramids, this group of enthusiasts hastily set about "excavating" these “formations”, on the very slopes where the 1984 monograph refers to the presence of two small Neolithic settlements. The following chapter (bs) in the monograph edited by Pavao Andelic is devoted to the end of the prehistoric era, for which there is a lot of evidence in the area of Visoko. During this period, for defensive reasons, a number of settlements were built on higher ground. Several of these prehistoric villages today bear the names "gradina", "gradac" or "grad", rather like the hill of Visocica, whose other name also contains the "grad" element. On the subject of this hill, which Mr. Osmanagic calls the "pyramid of the Sun", the monograph mentions "the huge amount of prehistoric ceramics" to be found "everywhere on the slopes", an almost certain indication of a "lengthy prehistoric settlement" from the Bronze Age until the Iron Age. 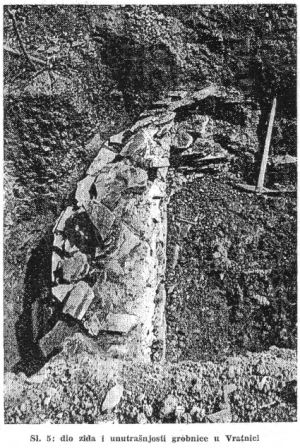 Stultitia compares these facts with various statements made by former members of Mr. Osmanagic’s team; for instance, the statements made by the archaeologist Silvana Cobanov (bs) in June 2006, when she referred to the discovery on the "pyramid of the Sun" of "neolithic weapons and ceramics"; and also the time when some artifacts were "lost" by the Foundation (see here and Stultitia’s article "The missing artifacts (en)"). Everything seems to be pointing to the fact that, before the Commission for the Protection of National Monuments extended the protected area to include the slopes of Visocica, the Foundation did actually "disturb" some Neolithic or Bronze Age sites, failing to carry out any cataloguing or documentation of the finds, the agenda behind their own "excavations" being to expose the pyramid "walls" in the shortest time possible. In conclusion, a large section of this chapter (bs) of the monograph is devoted to two Iron Age burial-sites, one located in Gracanica and the other in Vratnica, in the same place where Mr. Osmanagic’s Foundation is at the moment engaged in excavating a "mysterious stone structure (en)". The description of the tomb of Vratnica is particularly interesting: as noted by Stultitia, it displays numerous similarities with the rectangular structure –described a few months back as the "entrance to the pyramid" - found in test pit number 12 on Pljesevica. Both structures are situated at the foot of the hill, at the spot where the slope joins the flat terrain of the valley; they are of identical rectangular shape, partially dug into the slope; they have the same type of drystone walls; they are of identical dimensions, about 3 metres x 2 metres; down to the very "nails" found by the Greek archaeologist Nancy Gallou in the rectangular structure at Pljesevica, which are reminiscent of the fibulae found at Vratnica. Stultitia draws our attention to numerous clues pointing to the premise that the Osmanagic team removed the contents of an Iron Age grave on Pljesevica, one clue being the statement made by none other than the Egyptian geologist Mr. Barakat, during an address to the Egyptian Supreme Council of Culture. This statement was repeated in the following form in The Daily Star Egypt (en): "He indicated that he had found a tomb behind one of the pyramids. It contained human bones and organic materials which could have been a preserved organ or liquid food. Barakat said he believed the grave was some 5,000 years old." Although the mediaeval and prehistoric sites on Visocica might at the moment enjoy protection from Mr. Osmanagic’s catastrophic attempts at excavation - at least as long as the Minister of Culture Grahovac and the authorities of the Commission for the Protection of National Monuments are in charge – it is a different matter for the four locations mentioned above: Vratnica, Zbilje, Dvor and Ginje. And we haven’t even mentioned the fact that the sites known and described in Pavao Andelic’s monograph probably only represent one small part of the archaeological riches hidden in the valley of Visoko, a place occupied by man for more than 7,000 years . This archaeological wealth has been put at risk by political incompetence and a "pyramid-mania" which transforms businessmen, architects, geodesists or animal vets into “archaeologists.” Yet it represents a heritage resource of incalculable value: for science; for the region of Visoko and its development; and for the whole of Bosnia, which has already been forced to witness the destruction of an irreplaceable part of its heritage during the war. Anyone who professes to have any love for Bosnia would be well advised to consider this question very carefully. 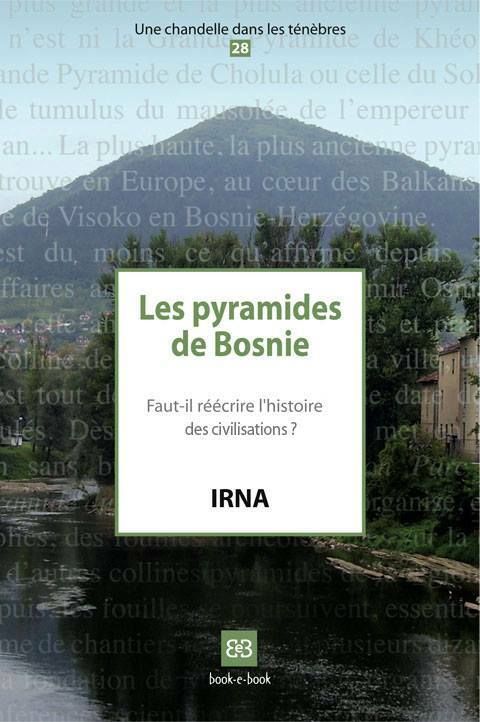 The reader will find here a short summary of the mediaeval history of Bosnia. Mile was the mediaeval name; Arnautovici was the name bestowed on it in the 17th or 18th century. There are bibliographies on this site (en). Johannes Müller in the September 2006 issue of Science Magazine. 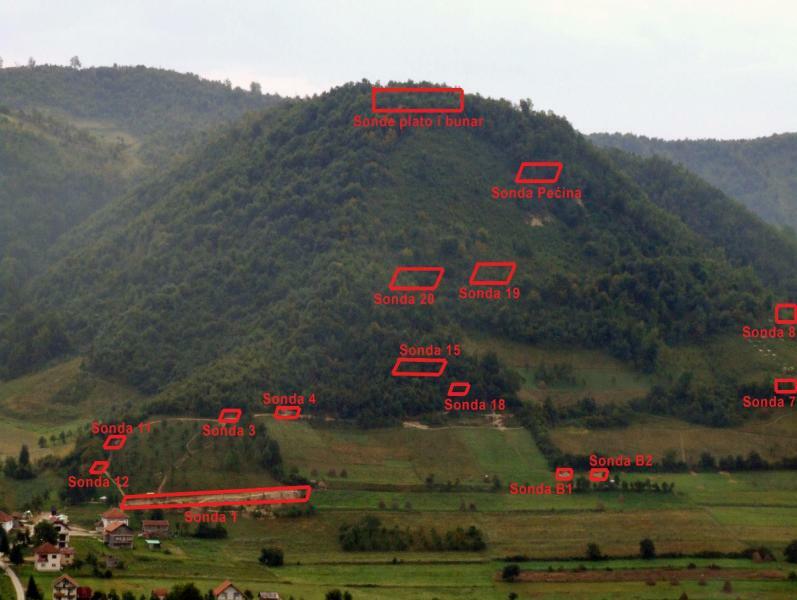 Irna, thank you for this post, it covers all important points with condensed clarity; it really gives the most important impression on how devastating Osmanagic’s activities in the Visoko valley could be in their final result.